Here, in New York, I have never smelled mangoes like them. Even in the midst of our Big Apple summer, when my fruit and veggie store has mangoes, I grab them, SNIFF furiously and NOTHING. I once visited a mango farm in Australia, in Queensland which was like being in mango heaven. Apparently, 92% of the mangoes grown in Australia are consumed there, which is great for them, but sad for me. Another thing I miss from Little Saigon is Vietnamese Lemongrass Beef Rolls. I’ve never seen them on a New York Vietnamese menu. They are finger-sized, leaf wrapped, parcels of lemongrass scented meat, studded with crunchy water chestnuts and dusted with peanuts. I love the contrast of the licorice flavor of the leaves with the sweetened fish sauce and lemon-ish beef. At restaurants, they come skewered together on a stick. They are best hot out of the oven, but work at room temperature as well, so they’re perfect for a potluck. I actually made them for our Chinese New Year potluck event a few years ago. Chinese New Year is around the corner, so whip them up for that or make them anytime. I used perilla leaves from my garden for the ones in this photo. If you grow them, you know they grow like weeds so this is a good way to use them up. These lemongrass spiced beef rolls were a favorite hors d’oeuvre we served when I was freelance catering cook in Melbourne, Australia. The kitchen was near Little Saigon, so we would buy these in rather than make them. In a medium skillet, sauté the garlic, lemongrass and ginger in oil until golden. Remove and cool in a medium sized bowl. Add ground beef, water chestnuts, sugar, fish sauce and black pepper to the bowl and mix thoroughly. To make the rolls, place a leaf on a plate so the back of the leaf is facing up. Take about 2 tablespoons of the beef mixture and roll it into a sausage shape that is not quite as wide as the widest part of the leaf. Place the meat on the leaf near the stem end of the leaf and roll the leaf around the sausage. towards the pointy tip. Place the rolls seam-side down on a sheet pan, until you are ready to cook them. Preheat oven to 350 °. Bake for 20-30 minutes until beef is cooked through. * You can buy the perilla and betel leaves in Southeast Asian grocery stores. 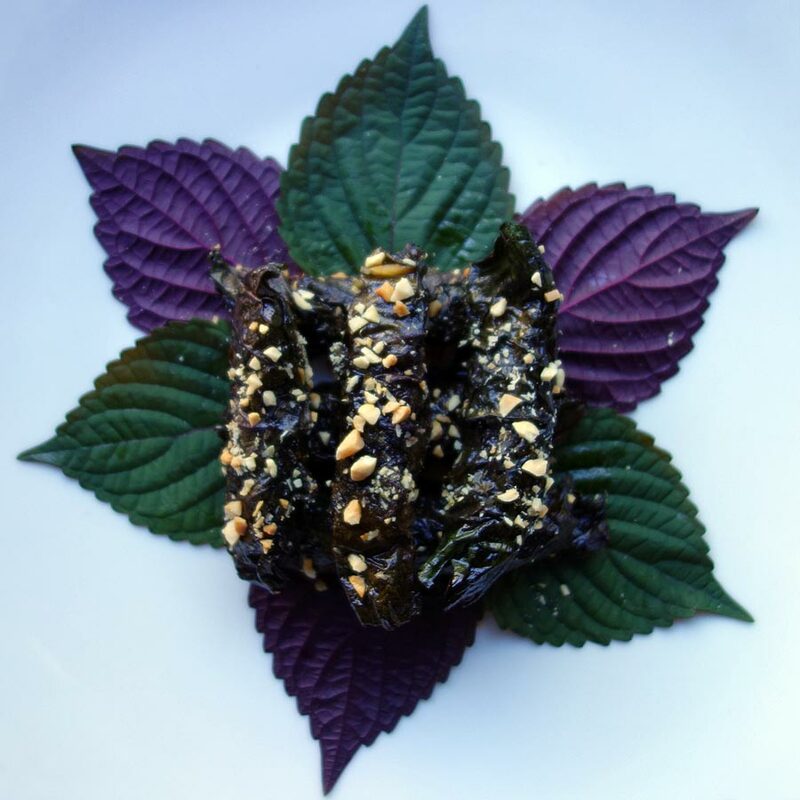 You can also use fresh shiso leaves which you can often find in a Japanese food store.